The Jet lathe has been manufactured by the second generation of the Meier family since 1980, their grounding being metalwork lathes since 1937. They make 3 types of wood lathe, the mini, benchtop and floor standing models in many varieties; along with Metalworking lathes costing up to a massive $ 27 999, however their smallest 321360A BDB-1340A is a mere(huh) $ 3,717. There is a good mixture of accepted lengths and diameters, some will accept large diameters but short lengths for instance, so you should estimate as well as you can if length or diameter is priority and if in doubt strike a happy medium. Spindle speeds vary too, from 0 to 3200 on the variable speed model, to 4300 on the benchtop JWL 1220VS in 6 set speeds. N.B. So that you are not going backwards and forwards following individual links you can click the underlined link just below to find most of them. When they are available at lower prices or the same elsewhere, you will find detailed links on this page and I may also place them on a new 'Discount Tools' page, on the Navigation bar to the left. The JET 708375 JML-1014I, 10-in x 14-in 1/2 HP Indexing MiniLathe takes a timber length of up to 350mm and a diameter of 250mm and is priced at $439.99. As of all models it has a cast iron bed but weighs a mere 30kg, which gives it stability and reduced vibration. Quite easy to transport or put away. A great choice for the model maker or newcomer to turning, to develop a feel of the tools without being daunted by a larger timber length. The middle price range of the jet lathe is model no. JET 708358K JWL-1442VSK, 14-in x 42-in 1 HP Woodworking Lathe with Leg Stand a floor standing model with a weight of 190 lbs. The price of this model is $1429.99. It will take a diameter of 14" and length of 42" which is adequate for quite large bowls and most spindles. This model has 8 speeds from 430 to 3000rpm, so that you can set the exact speed you require and is the most suited to large diameter stock turning. Should you be in two minds over your decision between this and a smaller benchtop or mini, this model will give you a much bigger range of items you can turn and if you are a newcomer to turning lots of scope for the future. 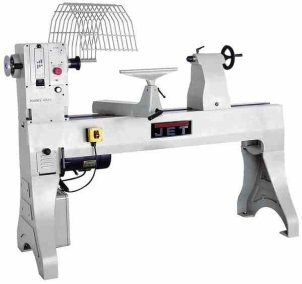 At the top of the range and with the biggest price tag is the JET 708360 JWL-1642EVS-2, 16-in x 42-in 2 HP Woodworking Lathe with a wallet crunching $2649.99 price tag, although it has been reduced in price. 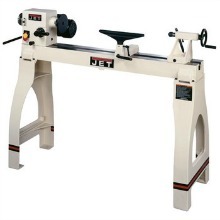 The JET 708359 JWL-1642EVS, 16-in x 42-in 1-1/2 HP Woodworking Lathe is the same model but 1/2 HP less and will save you $305 as it is priced at $2,344.99. These 410lb turning machines accepts diameters up to 16" with an optional standing tool rest and if your purse can stretch even further you can extend the length from 42" to 107", with the extended bed. That would be one heck of a Jet lathe turning project. The woodturning lathes are available through specialist distributors worldwide, who will provide you with comprehensive, in-depth advice and after sales service. CPoJet which is where 3 of the links on this page are directed are seldom beaten on price, so too Tool King, who you will find on the column to the right. They both have the same range as Amazon, who are often supplied by them. Operation manuals are included as standard essential items for each individual machine, which also have 5 years Warranty.